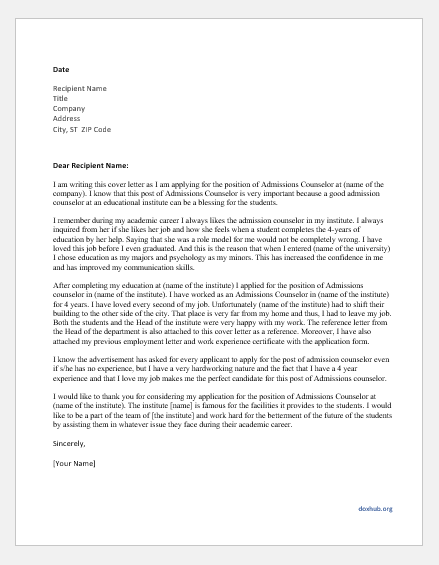 This letter is written with reference to you being absent for 5 days i.e. 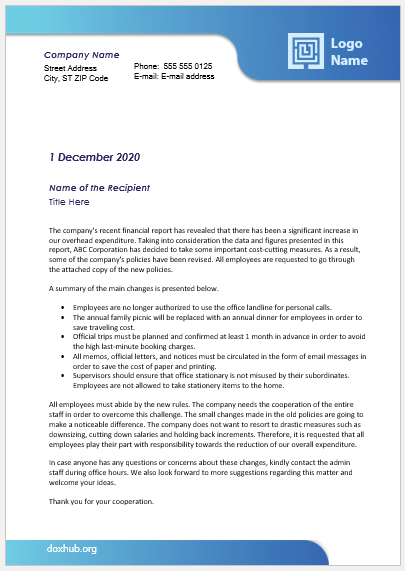 from [DATE] to [DATE] without any prior information given to the immediate supervisor. 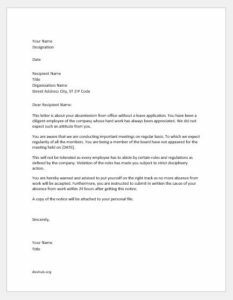 You have thereby violated the company policy by not asking for leave through a proper leave application. You are aware of the company’s rules and regulations. The importance of being regular at work has been addressed to employees many times. We believe that employee’s attendance at work is an essential part of the working of the organization. We intend to warn you that no more absenteeism from work will be tolerated and strict action will be taken against you if it happens again. The company laws demand from you in writing the cause of your absence from work for so long. 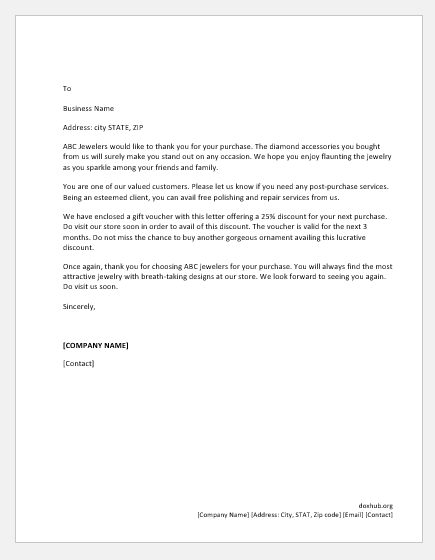 You need to submit it within 2 days after getting this notice. A copy of this will be attached to your personal file. We have continuously been updated by your supervisor about your late comings at work from the past four days. We notice it and decided to talk to you about it. Unfortunately, this could not happen because you are continuously absent from office followed by your lateness. It is the time that we warn you against such absenteeism from work. Your attitude towards work has made you subject to strict disciplinary action as you have violated company rules not once but many times. Through this letter we are warning you to change your attitude and bring yourself to the right place as this attitude of yours will no more be tolerated. 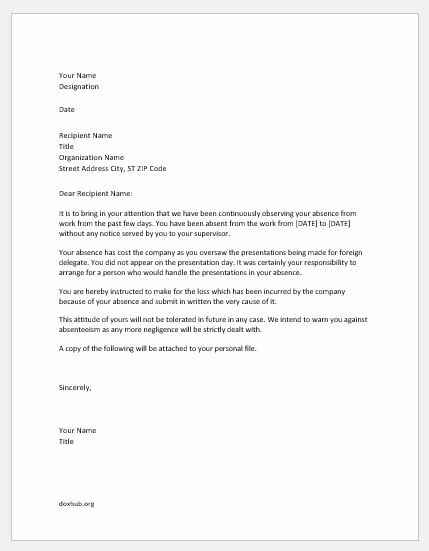 You are hereby instructed to submit in written the cause of your absence from work within 2 working days after receiving this notice. A copy of the same will be attached to your personal file. This letter is about your absenteeism from office without a leave application. You have been a diligent employee of the company whose hard work has always been appreciated. We did not expect such an attitude from you. You are aware that we are conducting important meetings on regular basis. To which we expect regularity of all the members. You are being a member of the board have not appeared for the meeting held on [DATE]. This will not be tolerated as every employee has to abide by certain rules and regulations as defined by the company. Violation of the rules has made you subject to strict disciplinary action. You are hereby warned and advised to put yourself on the right track as no more absence from work will be accepted. 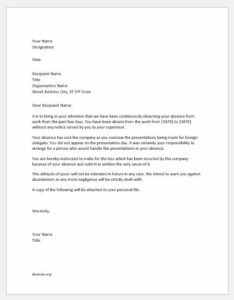 Furthermore, you are instructed to submit in written the cause of your absence from work within 24 hours after getting this notice. A copy of the notice will be attached to your personal file. It is to bring in your attention that we have been continuously observing your absence from work from the past few days. 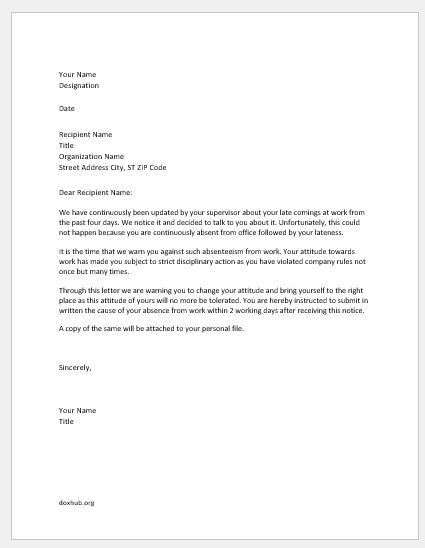 You have been absent from the work from [DATE] to [DATE] without any notice served by you to your supervisor. Your absence has cost the company as you oversaw the presentations being made for foreign delegate. You did not appear on the presentation day. It was certainly your responsibility to arrange for a person who would handle the presentations in your absence. You are hereby instructed to make for the loss which has been incurred by the company because of your absence and submit in written the very cause of it. This attitude of yours will not be tolerated in future in any case. We intend to warn you against absenteeism as any more negligence will be strictly dealt with.